Finished reading How Doctors Think by Jerome Groopman. How Doctors Think describes the warning signs of flawed medical thinking and offers intelligent questions patients can ask. The average physician will interrupt a patient describing their symptoms within 12 seconds. In that short time, doctors decide on the likely diagnosis and best treatment. Often, decisions made this way are correct, but at crucial moments they can also be wrong potentially with catastrophic consequences. Groopman pinpoints the forces and thought processes behind the decisions doctors make. He explores why doctors err and shows when and how they can, with the patients help, avoid snap judgments, embrace uncertainty and communicate effectively. 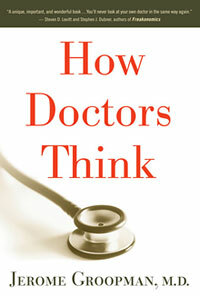 How Doctors Think is a fascinating book. Groopman discusses several interesting case studies where misdiagnosis had deadly results. All because the doctor was rushed to diagnosis and quickly move onto the next appointment. He covers cases in which a patient’s mistrust in their doctors accelerated their cancer. I now will feel more comfortable working with doctors to verify that a given diagnosis and treatment is the best option.